There are plenty of reasons why turmeric is good for you, but it can also be bad for you, especially when consumed in large amounts. The spice is a powerful anti-inflammatory and anti-arthritis agent, boosts immunity and boasts cholesterol lowering and neuroprotective properties. But the same beneficial properties that give it its wonderful health benefits are also responsible for side effects such as gastrointestinal upset, diarrhea, bloating, increased risk of miscarriage in pregnant women, mild to severe allergic reactions or medicine interactions. Turmeric (Curcuma longa) is a root spice of a vivid golden yellow color and particular taste. Turmeric belongs to the same family as ginger and the two rootstalk spices look similar in appearance to each other. Even more, they have a similar therapeutic action and share both health benefits and side effects. Just like ginger is bad for you in some cases, so is turmeric, especially when eaten in large amounts. Some people are more sensitive than others to the pharmacological properties of turmeric and may experience unpleasant side effects following ingestion. Turmeric can be both good and bad for you. This depends on whether or not you are sensitive to its active constituents or what you are using it for. For example, curcumin, the main biologically active compound in turmeric, generates the most benefits but also side effects. The fact that it’s found in turmeric supplements in concentrated forms explains why some people experience more side effects after taking the supplements than when simply eating the root. It also explains why many people experience a visible improvement in their health status compared to when eating the spice as it is. 1) Makes acid reflux worse. Turmeric is potentially bad for acid reflux, especially when eaten on an empty stomach, at night before bed and in large amounts. The spice has also been shown to interact with acid reflux medication such as antacids and some people report eating turmeric worsens symptoms like heartburn. 2) Causes stomach upset. Eating too much turmeric has been known to cause mild digestive upset with symptoms such as stomach air and bloating, flatulence and stomach pain. Moreover, turmeric can cause more frequent bowel movements, loose stools and even mild diarrhea. Some people feel the spice irritates their stomach and there have been reports of the supplements making gastritis worse. 3) Increases bleeding risks. Turmeric has natural anticoagulant properties and prevents, to a certain extent, blood clotting, hence the reason it promotes cardiovascular health. But for those with blood disorders that cause poor blood coagulation in the first place, eating turmeric, especially too much of it, can increase bleeding risks. Also, because it’s a blood thinner, turmeric can interact with anticoagulant medication like warfarin, potentiating their effect and, again, increasing bleeding risks. So talk to your doctor first if you have a blood clotting condition. 4) Side effects during pregnancy. Eating turmeric root is normally considered safe during pregnancy as long as consumption is limited to very small amounts. However, eating too much or taking turmeric supplements which contain a concentrated form of curcumin, the active constituent in the spice can potentially lead to a miscarriage. The spice not only interacts with normal blood coagulation and makes blood more fluid, potentially stimulating blood flow in the uterus, but it is also known to cause digestive upset with cramps and pain that, in rare cases, could encourage a miscarriage. While amounts from dietary sources are generally considered safe during pregnancy, but supplements are not, some experts recommend avoiding turmeric altogether during pregnancy for safety reasons. Your doctor can tell you more about the subject. Also see Turmeric in Pregnancy: Benefits and Side Effects. 5) Risk of allergic reaction. There is a possibility turmeric can cause allergic reactions in people with a certain sensitivity to the spice and its constituents. The fresh root, dried powder and supplements can all engender an allergic reaction. Symptoms of turmeric allergy may be mild or severe and include: skin rash, redness and itching, breathing difficulties, low blood pressure, lightheadedness and even anaphylactic shock. If you suspect you are allergic to the spice, avoid eating it. Other medical conditions turmeric may be bad for include kidney stones and gallstones. Also, the spice has been found to interact with antidepressants. Supplements which have a concentrated form of the bioactive components in the spice are more likely to produce side effects. Also, prolonged consumption can worsen side effects. Adulteration or contamination with heavy metals can also cause side effects, hence the reason it’s important to get your turmeric from reputable producers. Conclusion. It’s not a rule that we must all react the same way to a certain food. We are all different and it’s only normal that we respond differently to various foods and their constituents. For those of us that turmeric is good for, eating it can improve our health. Combining it with pepper, whose active constituent piperine makes turmeric more effective, can help improve its beneficial action. Piperine improves turmeric bioavailability, helping us absorb more curcumin and slows down its rapid metabolism, enhancing its health effects. But for those of us turmeric is not good for, it might be best to find other alternatives without side effects. If we listened to you we wouldn’t be eating or drinking anything except what your pushing. You are free to eat and drink whatever you wish in whatever amount you wish or feel is good for you, Henry. This being said, not everyone responds in the same way to the same foods. We are all different and what works for you will not work for everybody else. 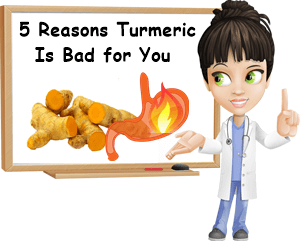 The same is true for turmeric: it’s a great food, healthy, with strong anti-inflammatory and antioxidant properties but will cause acid reflux and other side effects in some people. And the article simply focuses on the side effects of eating turmeric. Please consider that not everything applies to everyone so if a certain piece of information does not speak to you directly, that doesn’t automatically mean it’s not relevant for others. Wishing you lots of health. Unfortunately yep! I am someone who needs a liver transplant. Its needed now. This web page is showing us both sides, good and bad. Read the other pages. I started with the liver link. And yes, when your have late stage cirrhosis, your diet is definitely affected. I don’t wish this disease for anyone. Preventing that something to be taken seriously. Take the information and compare to other resources. Make your own decision. That’s all you can do. I am sorry to hear about your health problems. It’s a difficult situation and I truly hope you get the treatment you need and your good health back! And yes, prevention must be taken seriously and it’s always wise to compare sources, never take any information for granted. Because not everything applies to everyone or every situation. Again, wishing you lots of health! I took turmeric capsules and was very pleased–my memory came back like gangbusters and no longer any problem recalling names! I was more alert all ’round. But then I developed hideous diarrhea from it and had to stop using it. It took my system weeks to straighten out. I was really sorry that happened as it had been otherwise working great for me. I am sorry to hear you’ve experienced side effects from the turmeric supplements you’ve been taking, Joana. There could be a few reasons why the turmeric capsules were bad for you. 1) Depending on how many capsules you’ve supplemented with and for how long, you’ve likely exceeded what can be considered a normal, moderate intake of turmeric. And when consumed in larger amounts, turmeric is a source of side effects like diarrhea or stomach upset. 2) Taking turmeric supplements provides both several times the normal intake of turmeric and curcumin, the main active component of the spice. And it can be the higher intake of curcumin (that some people are more sensitive to) that could have produced the irritating effect on the gastrointestinal tract and the severe diarrhea. 3) Some dietary supplements may not contain what they say they do, either by accident or intentionally. There may be heavy metals present or the capsules may contain other ingredients that mimic the color, taste or pungency of turmeric. So the diarrhea could be an adverse reaction to a contaminant, either a heavy metal or another ingredient like horseradish, mustard etc. 4) Also, if you’ve never eaten turmeric before, it may be even a sign of an allergic reaction. While you’ve seen great improvements in your memory, it’s good for you that you discontinued the turmeric capsules. A lot of times, the side effects are not worth the benefits which you can get from other products. You can always try with another brand or reduce intake, but if you experience the same side effects or others, to a greater or lesser extent, it’s better to discontinue turmeric supplements and look for other foods or food supplements that provide the same benefits without the side effects. Turmeric is great, healthy and does provide wonderful benefits; at the same time, it can be a source of serious side effects and bad for you. Depending on your individual reaction to it, it may be a great addition to your diet or a food you may never want to eat again. And both are fine as we are all different and what is good for some of us is not necessarily good for everyone else too. Thank you for sharing your experience, Joana. I am confident it will help a lot of people who may have gone through similar situations and did not know if they made the right choice giving up turmeric. Wishing you lots of health! I am a healthy 67 year old man. I began taking Qunol Turmeric liquid supplement at the recommended dosage of 1,000 mg per day about 2 and 1/2 months ago. After a few weeks taking the supplement, my joints have been feeling really good, and in general I have been feeling fine. In fact, it is one of the only supplements I have taken which has had an effect that I can feel. However, about a month ago I started having very loose stools. Not a little. And it has not gone away. I have no bloating, or cramping, or stomach upset. Since I have had no changes in my diet I have been quite perplexed about what was going on. I was just about to call my doctor and make an appointment when I came across this web page. Now I realize I must stop taking the supplement, at least for the time being, to see if the condition improves. I will try to write again in a couple of weeks to let your readers know of my particular results. Hello, Hagins. Turmeric supplements usually have more concentrated curcumin and other curcuminoids, which are essentially the active components in the spice. And while healthy and a source of anti-inflammatory benefits in particular, these active components can also act as irritants, especially on the gastrointestinal tract. The higher the intake, the more visible the side effects for some people who are more sensitive to their action. And since the supplements contain more of these curcuminoids than you would get in normal food amounts, it’s possible to experience side effects like this. Considering you suspect these supplements are producing the loose stools, then it’s wise to discontinue them. As soon as the body flushes them out, which may take a few days, you should start seeing improvements. Make sure you stay hydrated in the meanwhile. In any case, it’s good to also see a doctor, even if just to get reassurance you are otherwise okay, or if the loose stools don’t stop. You can ask the doctor for other natural therapies to help with joint pain. There are reports sour cherry juice is an excellent natural anti-inflammatory. Some people find fish oil rich in DHA Omega-3 fatty acids is good for their joints. Personally, I take vitamin C and magnesium (and make sure I eat enough Omega-3 fatty acids). Although I don’t have joint disorders like arthritis, I must admit they’re really improving my overall health and I feel considerably better, less fatigued, more energized, I sleep better, think better, clearer and have less aches and pains, less joint stiffness and enjoy better mood. I also use an infrared lamp and it really helps with the occasional, more severe muscle aches, muscle contractions and joint pain. You can read more about the Properties and Benefits of Infrared Lamp. So it could be useful for you to ask your doctor about alternative therapies like these and maybe find one that is suitable for you, without the side effects. Looking forward to hearing about your follow-up with the turmeric supplements! Wishing you lots of health, Hagis! As expected, in only about 2 or 3 days of discontinuing the supplement, the problem of loose stools resolved. Everything is fine and back to normal in that department. Perhaps I should consider taking the turmeric supplement at a lower dosage and see if I get the the good effects without the bad. That is a worthwhile experiment, Hagins. It’s possible you don’t experience this side effect of turmeric supplements, but get the same or almost the same benefits from a lower dose. Eager to hear about your results, so please keep us posted! I developed an allergy to turmeric after taking it as a supplement for inflammation. I noticed a feeling of tightness in my chest, so as I have asthma, I stopped taking the capsules after a few days. I tried another brand but had the same mild breathing difficulty so I discontinued it. Shortly after I ate some food with turmeric and I had some mild swelling/ throat clearing afterwards… I didn’t realize it was the turmeric until a few more exposures. With each exposure my reaction became worse, until I was reacting even to even small amounts of turmeric in food used as a coloring agent, with major throat and mouth swelling that affected my breathing, and occasionally a rash. I had to start carrying an epi pen. Now I react just being in a restaurant cooking with turmeric, or walking into a store that has turmeric roots laid out in the vegetable area. 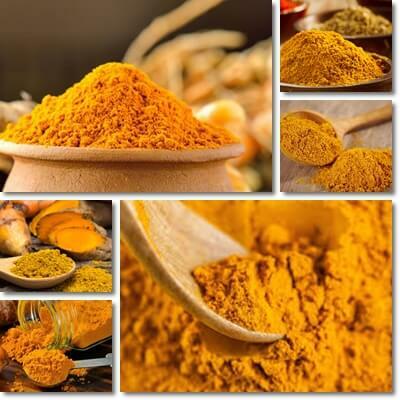 Before taking supplements I used to eat food containing moderate amounts of turmeric with no problem. Be cautious taking the supplements… It’s the worst allergy I have and it’s become so popular as a natural color additive that it’s hard to avoid. I’m so sorry to hear it, Z. Having food allergies is awful, but I can’t imagine how it must feel to develop a food allergy to a food you’ve eaten many times before. A friend of mine had the same thing happen to him, but it was strawberries – sudden strawberry allergy at 35 years old despite him having eaten the fruit all his life. Indeed, turmeric is an irritant. The same active ingredients responsible for its beneficial properties can cause side effects of the likes. Even those who are not allergic per say but have asthma can experience asthma attacks after eating or smelling turmeric. Often times it’s because turmeric causes stomach acidity (acid reflux) which then triggers the asthma episode. It’s good that you have your essential medication with you at all times and that you’ve stopped eating the spice altogether. Also, like you said, turmeric has become extremely popular as a natural color additive. In my experience, you can find it in all sorts of yellow or orange foods, mixes, dressings and sauces and in plenty of piquant dishes, so reading the label for ingredients is a must. Thank you for sharing your experience with us, Z. I am confident it will help a lot of people going through similar experiences. Wishing you lots of health! I was taking one capsule a day with bioperine 1950mg. Is that too much? Hello, Susie. It seems like a concentrated product (with 95% curcumin, the active ingredient in turmeric and black pepper extract). It has to be in order to provide some benefits, whether it’s reduced inflammation or better joint mobility or something else. But what you need to remember is that curcumin is a source of both benefits and side effects. And the more you take, the higher the likelihood of both benefits and side effects, depending on individual sensitivities or existing conditions (example: acid reflux, gastritis, hemorrhoids, arthritis). But there really isn’t a one size fits all amount, which means that you have to observe the effects the turmeric supplements have on you as you take them and see what your tolerance level is. If you’ve never taken turmeric supplements, it would be a good idea to start with small amounts first and see whether you can increase intake without experiencing adverse reactions. I would also take them after eating because curcumin is an irritant and can upset the stomach. If at any point you feel sick or unwell, it is important to discontinue consumption right away and, if necessary, see your doctor. Don’t accept feelings of unwell as signs of so-called healing because they aren’t. They are signs that you should discontinue consumption. I honestly think turmeric supplements do help with some conditions, especially those of inflammatory origin. At the same time, I have experienced their side effects myself and know many other people who cannot take them because the adverse reactions outweigh the benefits (a line of thought I wholeheartedly agree with). This is why I am neither recommending, nor advising against them, only telling you to observe their effects on you and, based on your experience with them, make the best decision for you. Hopefully, the side effects discussed in the article will help you make an informed decision. Hope this helps and wishing you lots of health, Susie. I started taking the turmeric 1 week ago. I initially cooked it in my rice. I didn’t notice anything initially. After 3 days of eating it in my rice, I started putting it in my smoothies. By my 5th day on the turmeric, I started experiencing what felt like heat in my lungs and severe pain what felt like in my lungs. I have a history of allergies, asthma and acid reflux that’s been problematic in the past. My breathing is bad & I made an appt to see my DR in 2 days. I’m glad o saw this article because now I know to stop using it. I couldn’t understand why my symptoms were getting worse. I’m usually very active, but I’ve been in the bed all day, and I noticed my stomach is also unusually bloated. I’m so very glad I read this article. I’m sorry to hear you experienced such side effects from turmeric, Sherry. While it has its benefits, turmeric is also a source of side effects and you need to be careful with it especially if you have had gastritis and acid reflux problems in the past or have a history of asthma. It looks like you’ve been having turmeric every day and it may be that it was just too much for you. The same active compounds that are responsible for its beneficial action can also act as irritants on sensitive mucous linings and trigger side effects, primarily acid reflux and digestive discomfort with bloating, burning sensation, stomach pain and other symptoms. The more turmeric you have at once or the more frequently you have it, the more likely and stronger the side effects. The heat in your lungs and the severe pain that felt as if it were located in your lungs could very well have been a strong episode of heartburn caused by acid reflux from the turmeric. What’s worse is that acid reflux is a powerful trigger for asthma. It’s good that you’ve stopped using turmeric and made an appointment with your doctor. It might be a good idea to wait a while until you’ve recovered before trying to introduce it into your diet again, that is, if you ever plan on doing so (preferably not every day and in very limited amounts). Don’t get me wrong, I love turmeric and am a firm believer it is a healthy food with many wonderful health benefits. But I am also a firm believer that it’s not for everyone and have experienced first hand the range of side effects it can cause. I have also been battling acid reflux and have had gastritis and know that turmeric and these two digestive issues are never a good match. While I still enjoy a pinch of it on occasion (like once in a long time, never two meals/days in a row), I don’t include it in my daily or regular diet because it is simply not compatible with my health. To me, the side effects are not worth the benefits, not to mention the benefits are not unique and you can enjoy them from other foods that do not elicit adverse reactions. This is an approach that has helped me immensely and I encourage you to find healthy foods that you can enjoy without experiencing side effects. Good health does not reside in one food, so don’t even give it a second thought if you can’t eat turmeric because it’s bad for you. Thank you so much for sharing your experience with us and wishing you lots of health, Sherry! Recently started taking a teaspoon a day in powder form (in food or just mixed with a glass of water) and my skin problem has worsened, my face has reddened. More pimples, spots. Not happy! I’m sorry to hear it, Pete. Considering the side effects you’ve been experiencing, it might be best to discontinue consumption and allow your body to flush out the turmeric so your skin may return to normal. It may be that the amount is too much for you, especially if you’ve been having the turmeric for some time now or haven’t really eaten it before, or it could be that it’s just not a good food for you. I’d suggest you have an allergy test too because symptoms such as spots and red skin may indicate a possible allergic reaction to the turmeric or possible contaminants in your product. If you also experience difficulty breathing, swelling of the tongue or throat swelling, low blood pressure, fainting, nausea, vomiting sensation, fast heart rate, know these are symptoms of an allergic reaction and you need to seek medical help immediately. Hope this helps and wishing you lots of health, Pete!